I-10 westbound out of Phoenix, heading toward California. I started this post on Monday, and then the week started. Before the day was done, I had hit the road again; destination, Thousand Palms, California, near Palm Springs, where I was invited to meet Marko Rodin, father of Vortex Based Mathematics, and shoot some video. 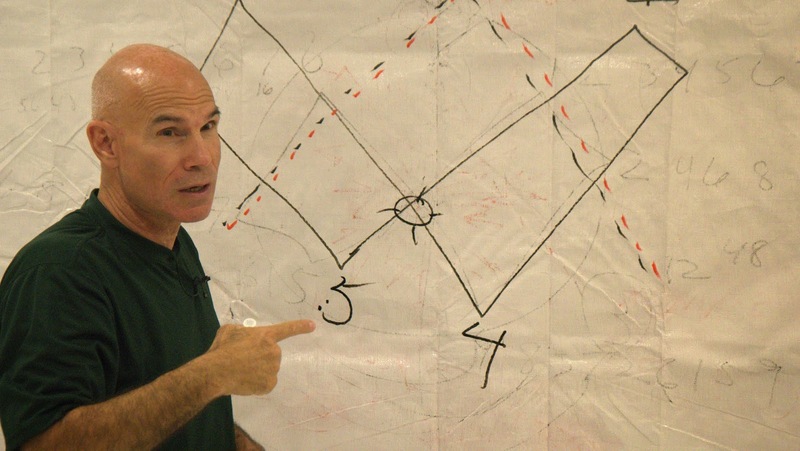 Marko Rodin’s math system can help us redefine our understanding of what is possible. Now that I am home again, I’ll complete my prior thoughts. The trial of UNITED STATES v. LOUIS DANIEL SMITH for his role in distributing the product known as “MMS” or Miracle Mineral Supplement, was set to begin March 2 in Spokane, Washington, but at the last hour, a continuance was granted. The new trial date is May 18. In the intervening time I invite you who have followed this story, understand its implications, and are resolute that this trial shall be administered equitably, to go beyond prayers and exercise your innate and inalienable power, through intention, imagination and visualization, to (1) be palpably present at the trial even if your body is elsewhere, (2) hold everyone to the Truth, the Whole Truth, and nothing but the Truth, letting all parties be conscious of the fact that they are being watched, and that the effects of their decisions will be accounted for, and (3) “see” a just ruling as the outcome. Please note that you have the power to do this whenever you come across this article and wish to add the power of your intention, imagination, and visualization. Please also note that there is no “favoritism” in this invitation, except perhaps, if you consider allowing any party to be exempt from being truthful, whether the prosecution or defense, an act of favoritism. The only point of favor is truth. Anything else will not mix if there is to be “justice.” If truth is not present on either side, then any verdict that is reached will be subject to reversal. While the sands of time flow through the hourglass toward the trial date at our current level of perception, all potential, “probable” outcomes have already been reached. Your “presence” and “energy” in this matter now influences the “verdict” that eventually sees the light of day at this level of experience. All probable outcomes already exist. Please be aware that what you wish for another through the action of your intention, imagination, and visualization — whether for “good” or for “harm” — you experientially potentiate for yourself because, believe it or not, we’re all connected, and part of a ONE. Daniel’s actions, as well as those of the FDA and Department of Justice, are the out-picturing of forces and energies that live within each of us. How they are ultimately resolved are determined by the extent to which we look into our own hearts, and detoxify the patterns of thinking, acting, and reacting, within one’s self. You can still support Daniel’s efforts to fund and mount his defense at his website www.standbydaniel.com. Compartmentalization has been part of our culture for so long that we generally operate as though there’s no connection, and that we can get away with actions and activities that are deceptive, destructive, and dishonest. However, because we are a ONE, no one is exempt from accountability for the effects of their choices and actions any more than sunlight chooses who is worthy to get its light, or oxygen would deny itself from the most obscene offender to human decency. We err when we think that “judgment” comes from an outside party; another person, a panel of experts, or even God. The “judge” and the jury, is us… our true peer. This may sound like gibberish to some, and will ring true to others. The distinguishing factor is within the mind and heart of the individual. What you see depends on your perspective. Two people can look at the exact same thing, but “see” totally different images. Take my comment on sunlight and oxygen. One way of looking at it is to consider that neither sunlight nor oxygen have intelligence, and hence, choice. Another way of looking at things is that Nature knows something that we have yet to figure out. The light of the sun makes life as we know it, in dense, corporeal form, possible for everyone. However, although we’re free to see ourselves as the form, there is ample evidence today that they are not who, or what we are. The physical body supports the appearance of individuality and separateness while we are here on Earth. However, through science, education, religion, and culture, it is easily for us to question or even doubt whether the ONE that makes all existence, and all that exists, knows we exist, or cares. That ONE is “you.” That ONE is “me.” It does not, and cannot “die”, cannot be contained or controlled, but can be worked with when we harmonize and balance our vision and intent. You may not think that our intention, imagination, and visualization are powerful, but that is expected because, for quite some time, a great effort has been given to cultivating low self-image. When we think little of our self we allow others, who have clear intentions and can influence human beliefs and imagination on a mass scale, to use ours, particularly the imagination. The process has accelerated as we’ve jumped fully into the Information Age. A cursory look at television programming, from news and “reality” programs, to dramas, shows an inordinate bias toward the subject of crime, murder, betrayal, deceit, and mayhem as major plot points. The idea that these programs suggests is that some people are simply “evil,” while others are “good.” The other message is that the “good” will take measures to “defeat” the “evil” by any means necessary, although mostly, it will be done by killing the adversary with the assistance of some form of weapon. 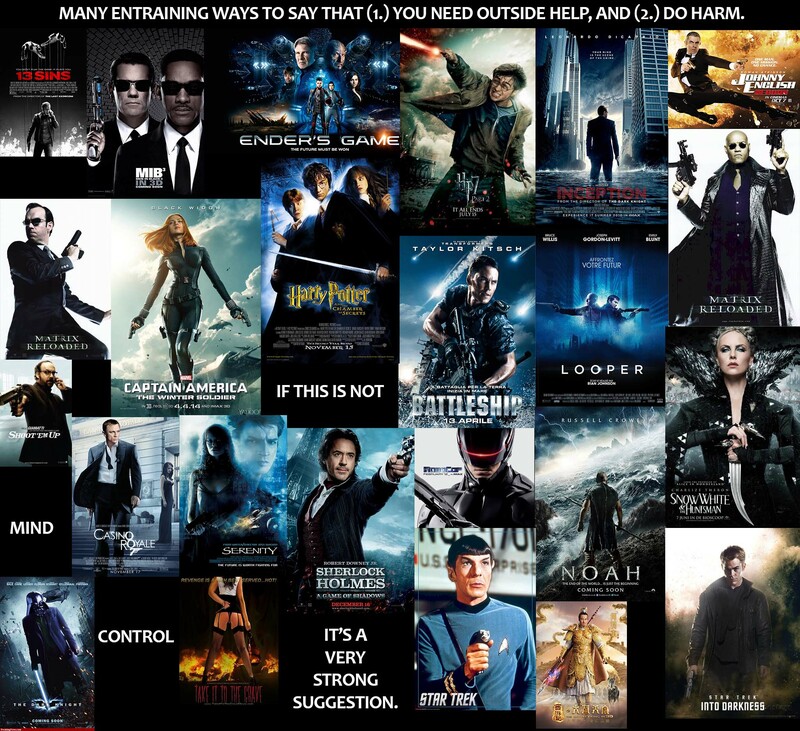 A look at just a few movie posters shows what I mean. Taken one at a time, the message is easy to miss. I referred to the methods as “entraining” instead of entertaining, because that is what is actually done, stemming from the word “entrain,” or to draw you along with, or after the idea being posed. How are you being drawn along? Through your powers of intention, imagination, and visualization, when you are under the mistaken belief that such immeasurable actions are meaningless. They are indeed immeasurable, but they are anything but meaningless. How else would we have such a strong professed cultural impulse to value life, and even think that life is sacred, but be so willing to kill another to “protect” some stuff that we’ve deemed is more valuable than human life? Politicians can say that we are a nation that wants peace, but seems hell-bent on getting into a war somewhere “far away” under the guise of “protecting” us. In the meantime, they take great measures to enable others to fight while domestically, another undeclared medical, mental, emotional, and financial assault on the People of America continues. People are now seeing ever more clearly what’s going on in our world today, and are asking “Why? !” It’s a question most do not want to ask, for it begs an answer. I suggest that it’s not really about money. I suggest that it is about you waking up and seeing the truth, discovering the lies that we have been told throughout our lives, about what is “right” and what is “wrong,” and who is “good” and who is “bad”… or “better than,” or “less than” whom. We grew up on Santa Claus and the Easter Bunny, and Jesus Christ “dying” for our “sins.” (Many still believe that one.) We’re told to honor truth, but have been, and are yet being told a million lies. Here’s a truth for you that you may, or may not believe. You are far more powerful than you know, as is every other human being. You are very close to God, just as you are, without changing a thing. No one is “closer” to God/Allah/Creator/Source than you are or I AM. It doesn’t matter whether you “believe in” God/Allah/Creator/Source. What matters, is whether you love. If you choose to be a conduit for love, beauty, harmony, gratitude, and balance, your awareness will expand and the quality of your experience will change for the better. Choosing to love will even improve your health and well-being. It’s one thing that no one needs to be taught. The sad fact is that in today’s culture, loving is what we’re taught not to do, and encouraged not to be, for the “opposite” of love is not hatred; it is fear. Hatred is an expression and degree of fear. Love heals wounds in ways that would make drug makers drool. The FDA can’t claim love as a drug, although I wouldn’t be surprised if someone tried. If they did, would you let them? Would you tell them how asinine such an idea would be? If we know that declaring love a “drug” is an asinine idea, why is it do we still allow healthy children to be filled with known damaging chemical agents called vaccines? For that matter, why do we continue to allow fluoridated and chlorine-treated water into our homes? The answer lies in the “time-delay” between input and adverse reaction. The longer it takes, the greater the plausible deniability. Most parents buy the “risk story” that the medical professionals tell them and newscasters report (from press releases), and are simply trying to make it through the day with as little hassle as possible. They are unaware of the ingredients that go into vaccines these days, and couldn’t fathom that a health care professional or system would put their children in harm’s way. Here’s just a few from various vaccines. I’m not saying that placing children at rick is intentional on the professional’s part, because it is their job. But the “motives” of a soulless and medical heartless system, may be another story. Yes, there are people behind every level in the medical system as well, but even there, relegating their policies to money and profits seems too simplistic as well. Ultimately, the system is pushing humanity to either wake up and reclaim responsibility for their choices, as well as their power to be healthy (because it is still there) and to heal, or live a sickly, dull-witted, drug addicted life. That the drugs are “FDA-approved,” mean nothing. We sometimes allow ourselves to be party to heinous acts against other humans after being told that “they” are the “bad guys” and “we” represent “the good,” and that “God is on our side.” This is the fast track to war, all the while the promoters proclaim that they want peace. 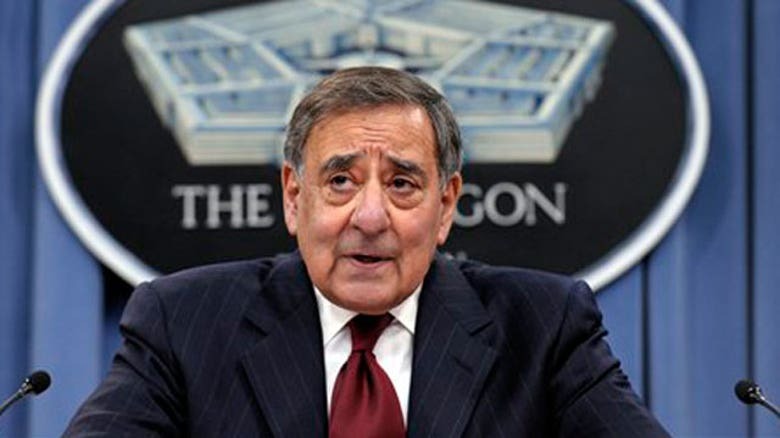 Former CIA director, Leon Panetta, validates the “threat” that ISIS represents, and says that Barack Obama was “right” in electing to go to war. Promoting his book “Worthy Fights,” Panetta lends credibility to the idea that the extremist Islamic group, ISIS is a legitimate threat to the safety of the American people, and therefore, we should be doing what we can to stop them. However, remember the entrainment images above. It looks like ISIS has been created, either with our help, or instigation, so that someone would have reason to continue meddling in the affairs of the Middle East. The point in all this is that you are given much reason to BELIEVE that you are “at risk” and unable to fend for yourself. Therefore you imagine all sorts of “villains” from human, non-human, to insect, chemical, and microscopic, that can vanquish us. The assumption is that you are unprepared to handle them. In the process, you imagine all the various scenarios that are suggested. However, it’s a carefully orchestrated spell. Until lately, I’ve stayed away from the word “God” most of my writing life. Not because I didn’t “believe” in God, or some form of “Supreme Intelligence.” Simply, the interpretations that are offered by various religious bodies and their representatives, as being definitive, more often engendered a pause response rather than an affirmative one for me. Nonetheless, I have respected all positions, even as I sought to find the one that worked 24/7 for me. Increasingly, all paths for the answers that I sought continued to point to something, somewhere, that is within me. Now I see that “answer” as something that I AM within. For that matter, though some might be inclined to debate or disagree, the answer is within each of us. We could not exist here without The Answer being within us. Love is liberating in many ways, because when you choose to be loving, conscience is cleared, spirits lighten, the heavy burden of mental and emotional seriousness is lifted. Best yet, fear levels go down when replaced by love, our perception expands and opens up to worlds and life beyond this one, both with healthy bodies that we are familiar with, and without. Recently I began studying in earnest, the works of Walter Russell. It appears that mankind has not yet reached an intellectually advanced age, despite the seeming wonders of his technological and material progress. Instead, he is still in the Barbarian Age of man-killing. I say “appears” because I now realize that human beings are far kinder, more compassionate, friendlier, and intelligent than the controllers of information would have us believe. The limitations and crises that humanity faces are predominantly man-made. Solutions have been worked out by human beings too, who have been subject to great risk for acting on conscience. Yet, conscience is the only way that we are going to change the status quo, because it has relied on keeping us unconscious, and trusting of invisible slave masters. We are not slaves, even if someone thinks they own us. “We” that I refer to are not compartmentalized groups, but All humans. The slave masters don’t proclaim themselves as such. They don’t have to. The systems and practices that are in place today, which maintain the perception that (1) we are alone in the universe, (2) we live on a hostile planet and must be on guard from all sides, (3) we must build walls and barriers to keep ourselves from each other, (4) there’s not enough to go around, have been in operation for quite some time. Believe it or not, ONENESS means that we are ONE with the slave masters too. They are no closer to Source that we are, nor are we closer for suffering the lying and deceitful schemes that they have successfully played on a trusting humanity for so long. Each must decide when the charade ends, and have the courage to make it true. It begins when you begin using your intention, imagination, and visualization, to see the world as your heart desires. People who have actually done no harm, and who have helped their fellow-man, will not be harmed for it in the world that I am envisioning. Here’s a talk that you will find interesting. Technology is no measure of evolution. The litmus test of an “evolved” and evolving individual, is his or her proclivity to love unconditionally. Love is the X-factor that can, when inserted, change every “crisis” situation that many have been convinced are real. You don’t have to try it on anyone else. If you begin to contemplate what loving yourself means and start doing that, your life and relationships will start to change. You are equal. Others are equal. How do you treat an equal? How should another treat you? Give to others what you seek for yourself. If it doesn’t come back to you, don’t judge the other; maintain your equanimity and judge the situation, as Life will give you your Roadmap for Change. When man really knows his equality and unity with all men he cannot possibly kill, or even deceive. He will honor himself by honoring others with truth. He will not seek to “take another down,” because to attempt to do so, is to lower one’s self. From Walter Russell, Atomic Suicide? As long as man continues to think of his body as being his individuality he will think individually, rather than universally. When he, at long last, discovers his eternal Self to be the projector of his own body, and is making himself in his own image, he will then know his universality, his Oneness with all Creation. He can never thereafter think of himself as an individual and will so act in all of his transactions in relation to his Oneness with all other men. I’ll end this with another picture I shot while heading west. Nature is amazing, even at 80 miles per hour. There appeared to be rays of light coming down from the cloud bank above. The sun was to the west. The rays were east of me. The source of the light that filtered through these clouds wasn’t the sun. Yes Adam, I will be there without my body postulating the outcome! Mcuh love to Daniel,, his family and Yammy, etc.